A képre történő kattintás után megtekinthet minden rendelkezésre álló fotót a (az) Departamentos Avis-hoz. grillezési lehetőség, fitneszközpont, szolárium, szabadtéri medence, terasz, napozóterasz, családi szobák, lift, fűtés, összes közös- és magánhelyiség nemdohányzó, légkondicionálás. Featuring an outdoor pool, Departamentos Avis offers self-catering accommodations in Villa Carlos Paz. Free WiFi access is available. 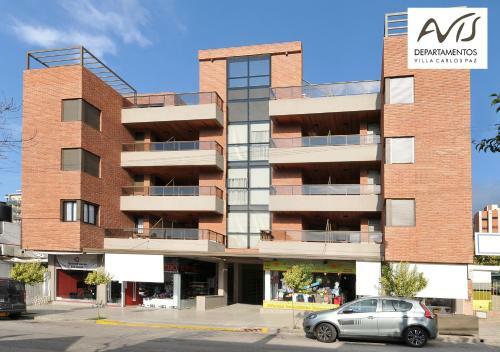 The property is 30 metres from 9 de Julio Pedestrian Street and 200 metres from Córdoba Casino. Each apartment at Departamento Avis features air conditioning, a balcony with views of the city and a fully-equipped kitchen. All of them include a complete bathroom and dining and seating areas. They are fitted with heating, a flat-screen TV and a washing machine. Guests at Departamentos Avis can enjoy the sun terrace and the barbecue facilities. The property offers free parking. Departamento Avis is 100 metres from Nuestra Señora del Carmen Church, 150 metres from Shopping Mall, and 600 metres from City Hall. Cuckoo Clock is 800 metres away. Please note the based on local tax laws, all Argentinian citizens and resident foreigners must pay an additional fee (VAT) of 21%. Only foreigners who pay with a foreign credit card, debit card or via bank transfer are exempt from this 21% additional fee (VAT) in accommodation and breakfast when presenting a foreign passport or a foreign ID along with a supporting document handed by the national migrations authority, if applicable. A security deposit of USD 100 is required upon arrival for incidentals. This deposit is fully refundable upon check-out and subject to a damage inspection of the accommodation. Payment before arrival via bank transfer is required. The property will contact you after you book to provide instructions.